While many of us are working towards our own personal goals for 2019, the new year also brings new opportunities to adjust our business goals and determine how each department can better contribute to the overall plans for the company. When it comes to corporate travel management, a few adjustments can make a huge impact on your company’s bottom line. 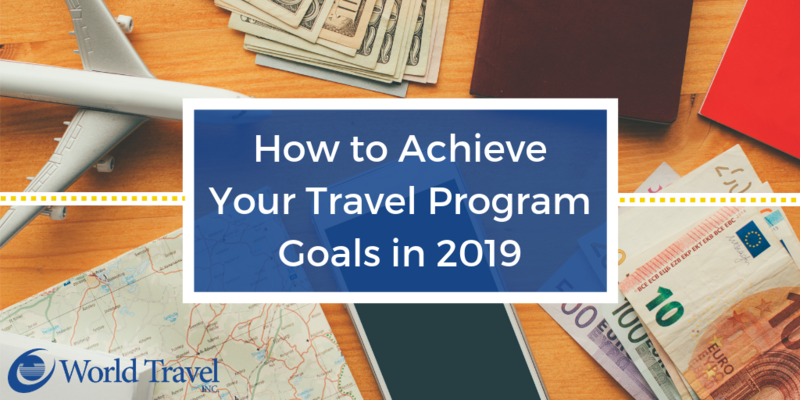 Have you set goals to improve your travel program in 2019? If so, what steps will you take to achieve them? If you don’t have your goals finalized or don’t have a plan in place just yet, don’t worry! It’s not too late, and you certainly don’t need to go it alone. Below are some of the most common travel program goals set by companies each year, and steps that World Travel, Inc can assist with. Increasing online adoption (i.e. the traveler’s use of the online booking tool) is a common goal among companies that are looking to reduce costs. If most of your travelers are booking through an agent as opposed to through an online booking tool, this may be driving up costs since agent assisted bookings usually require a higher service fee. Before you push travelers to the online booking tool, your TMC should make sure it’s configured to fit your travel policy, provide access to an online help desk to answer any questions you have and communicate outages, and continually work with the online booking tool to help correct any issues. A few strategies to drive online adoption include mandating or providing incentives for online booking, further educating travelers on how to use the online booking tool, etc. 2. Optimize Supplier Agreements / Negotiate Rates. Are you getting the best deal on your company’s travel? If you’re looking to reduce costs this year, optimizing agreements with suppliers is a good place to start. Car, hotel, and air contracts can be negotiated on your behalf to ensure that your program is taking full advantage of discounts available to you based on volume and market share. 3. Implement a Global Travel Program. If implementing a global travel program is one of your goals this year, be sure to talk with our team! There’s a lot to consider as you prepare to globalize your program, including duty of care, cost, compliance, cultural and market differences, technology, etc. It can easily be argued that risk management is one of, if not the, most important goal for any travel management program. To make improvements, it’s important to evaluate what tools you are using for real-time traveler tracking, alerts to both travelers and travel managers, itinerary-accessible security information, mobile access, etc. World Travel, Inc. offers a host of tools and services that can help you improve duty of care, while also partnering with global risk management companies that specialize in medical and travel security assistance. 5. Ensure Traveler Compliance with Policy. To improve policy compliance, you must take stock of where you are now. For example, how many transactions have been booked out of policy in the last year? What strategies have you deployed so far, and how strict are your approval processes? While there are many creative strategies that can be used to increase compliance (just ask our team), policy compliance can also be enforced when mandated, with hard-stop approvals, or with a lack of reimbursement. A phrase first used by Sir. Francis Bacon back in 1597 says it best: Knowledge is Power. Do you have access to all the reports you need to run your travel program efficiently? How are you leveraging data to improve your program moving forward? At World Travel, Inc., our account management team works with you to leverage your travel data day-in and day-out. We also offer a proprietary reporting platform that makes it quick and easy to access your travel data, allowing you to track trends and pinpoint anomalies. Looking for more strategies to save money, but not sure which goals to focus on? Our team will help you evaluate your travel program and work with you to identify and pursue additional opportunities to save your company money. However, as you pursue your goals in 2019, don’t forget to keep the following in mind. Many forecasts have been published that predict potential changes in the travel industry this year. Instead of sending you off to wade through all the information, we’ve pulled out the most important data points (i.e. rate increases) to pay attention to as you work through your goals. See below. According to a report by Global Business Travel Association (GBTA), airfare is expected to increase by 2.6%. Across the board, rate increases will impact your travel spend, and it’s important to factor this in, especially if your main goal is to save more money on travel this year. For more tips on how to reduce travel and expense costs, check out our recent article here. Regardless of whether you’re a current client, we’re happy to talk through your goals for 2019 and what strategies you can implement to achieve them. Post a comment below, contact our sales team at sales@worldtravelinc.com, or contact your World Travel, Inc. Account Manager directly. We’re looking forward to a prosperous and productive year for all!